Boy, do I enjoy comfort food! We each have our favorites. For me, meals that include mashed potatoes and creamy gravy, spaghetti with meat sauce, egg salad and tomato soup, or home-made pizza covered with mozzarella and pepperoni always bring a smile to my face as I sit down to enjoy a meal. Of course, it’s even better when I’m sitting across the table from the one I love. This past week, I had the opportunity to enjoy a different kind of comfort food. I traveled to Wishek, North Dakota, to participate in 2014 officer training activities organized by PDG James Ruff of District 5NE. I had the opportunity to work with presidents and vice-presidents–some new, others returning–as they began the process of preparing to lead their local clubs in the upcoming year. 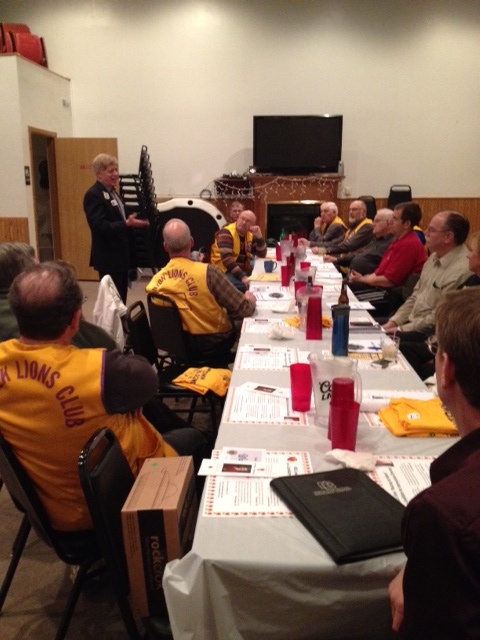 PCC Robert leads a discussion with Lion leaders in Wishek, ND. The evening started with a delicious meal that included one my favorites–mashed potatoes smothered in beef gravy! I remarked to PDG James that he couldn’t have picked a better choice and he nodded and smiled. The training went well and each club leader had an opportunity to talk about what s/he felt would be the greatest challenge for the upcoming year. We shared ideas and talked about strategies that might be used to overcome some of the potential obstacles for the clubs. On the drive home, I felt a sense of satisfaction and comfort. Over the years, being able to help emerging and experienced leaders to address issues they might face has been rewarding. I feel at home being a trainer and serving the needs of the clubs seeking my advice and assistance. The experience brought a smile to my face as I drove and I was eager to share my good feelings about the event with others. In a few weeks, I’ll be conducting a similar training session in Enderlin, North Dakota, for another set of presidents and vice-presidents. I am looking forward to the event because there’s nothing like the “comfort food” of working with and serving current and future leaders for “hitting the spot” in the heart of a Lion! Being with Lions is always a joy — glad you could be there to offer your special expertise.